As I wrote my last post, a couple of days ago, I noticed my “Blog Archive”. It hangs out on the right side of my blog. The archive is a history of all the posts I’ve written since I started my blog. I wrote my first one on March 10, 2011. Look. It’s obvious, isn’t it? The steady decline in number of posts. I began to think about why, particularly this past year, I don’t blog much anymore. I do tend to get obsessive about my “hobbies”. Although, to describe my writing, posting and blogging as a hobby? No, that’s doesn’t do it justice. It meant means much more to me than that. There are so many reasons why my blog was is so essential to my being. But that topic is for another post. No, this post is about why I don’t blog much anymore. Take for instance 2016. I only wrote 54 posts. And if it wasn’t for April’s “A to Z” challenge, 2016 would only have had 28 posts. Okay, I cop to laziness. Yes, that is a factor. Why spend an hour or two pondering and contemplating, staring at a blank screen seeking inspiration? Why agonize over choosing just the right word to creatively complete a poetic phrase? Why immerse myself in introspection, blocking out Rico’s barking, the blaring TV, or the worries of the world? Why would I do all of that when in just 140 characters and a few seconds, boom! It’s out there. Whatever nonsensical thing I have to communicate can easily be stated in an captioned photo, right? See? I don’t even have to think about what I’m going to write about. Yes, the main reason I don’t blog much anymore is I’ve been seductively lured by the instantaneous social media Facebook, Instagram and Twitter gratification which has snared me in it’s sticky WEB. Before I wrote this post, I began to read a few of the 662 posts I have written over the past six years. Ross always encourages me. “You really are good,” he’ll say. “No, I’m not,” I’ll answer. Maybe the truth lies somewhere in between those two. But, as I was reading this one past post in particular, I became very emotional. What I wrote, it made me feel. The feeling? No, it wasn’t instant. It was better because it was quietly, thoughtfully and slowly nurtured. Thanks, Betty. You have just given me a little incentive to do the A/Z. I was unsure about it. But then again I say that every year. The part about being unsure. I feel the same way about my blog. It is where I put it down and if others read...good. If they don't....good. I write for me! Great post - and so true. When I slowed down, this past year it was because I got lazy and facebook was easier. Truth be told, I detest Facebook, but the family is on there and it is the preferred way to communicate. It does nothing for my creative outlet. I blog because I have to. It's cheaper than therapy. Thanks, Debby. I think FB has changed so much over the years. Frankly, I liked it better when people just posted pictures of the family, particularly the kids. Now it has turned into something else. I have the opposite issue. Last year my blog count went up. I don't think there's anything wrong with not doing a lot of posts. We all have periods where we don't have much to say. Perhaps you should just start writing more serials. Those were great. I like the way your blog has a theme. I enjoy your knitting/crochet days too. Ahh yes, the serials. I’ll have to re-visit them. This explains a lot. 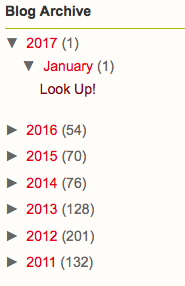 Every January I look at the list of blogs I follow and delete any that haven't been updated for over a year. I don't like to list inactive blogs as I know how frustrating it is to follow a link to a blog that has been consigned to history. This year I have found myself deleting blogs that were very, very active. I worried about what might have happened. Now I realise that the authors are simply using social media. Sadly, I don't really use it much. So I will just have to miss some of my favourites. Well, Una, certainly would miss your blog. I love your knits!